“This project certainly represents a three-dimensional portrait of my wife Roberta and myself, represents an architectural manifesto, is a hymn to truth, beauty, transparency. I tried to create a happy place where you can design daydreaming; I realized a place able to change its aesthetic and evocative features throughout the day, in relation to natural and artificial lighting changes. 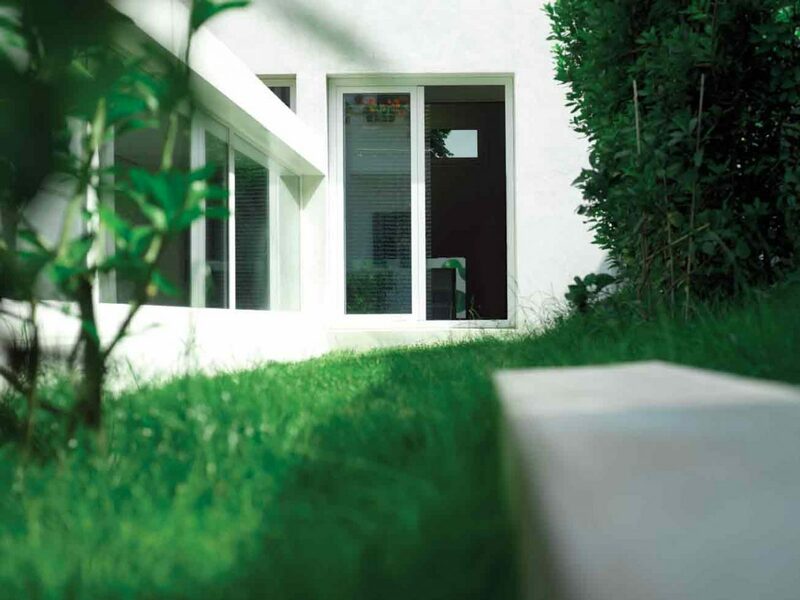 White pigments, effervescent polychrome shouts, bald and polished surfaces, compositional interactivity, represent the basic elements of this volumetric performance, thought to continue, day after day, to be in love with life.” Simone Micheli. A fifteenth century compound, used as a post office, characterized by large spaces with stone paving and cobble stone where the horses used to stop, high ceilings with wooden structure and masonry walls mixed represent a charming and fascinating heritage, for a strong architectural intervention recovery. 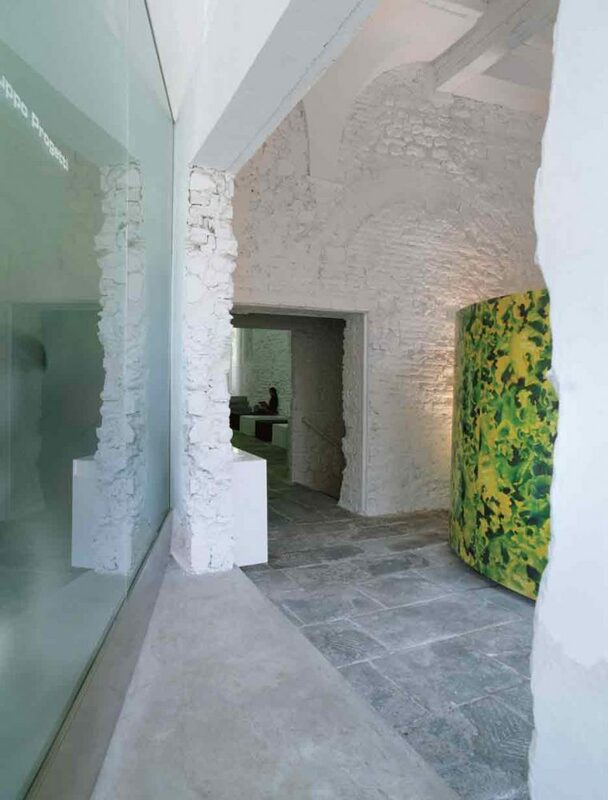 The renovation has put side by side the new with the old creating an harmonious dialogue characterized by continuous opposition and studied assonance/dissonances to create an exciting space that hosts the architectural studio Simone Micheli. Four hundred square meters restructured and brought back to life, enriched by essential furniture with chromatics in the light and a lighting system that uses incandescent and halogen lamps, headlights and lighthouses led to emphasize every detail, every present node. The space is characterized by multiple volumetric areas that interact in a synaesthetic way transforming the old stereotypes in a metropolitan and organic loft. 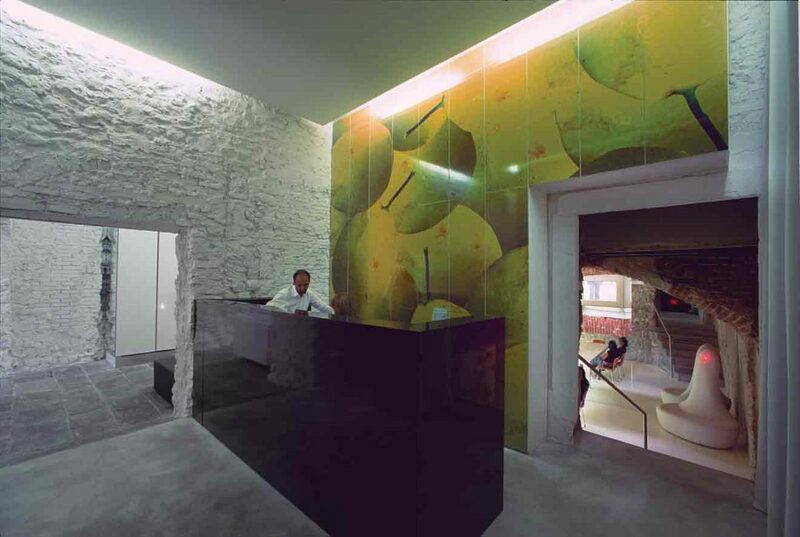 The areas that characterize this immersive and functional place are: the reception area, waiting-archive, meeting room, bathroom area, development projects area, graphics department, Arch. 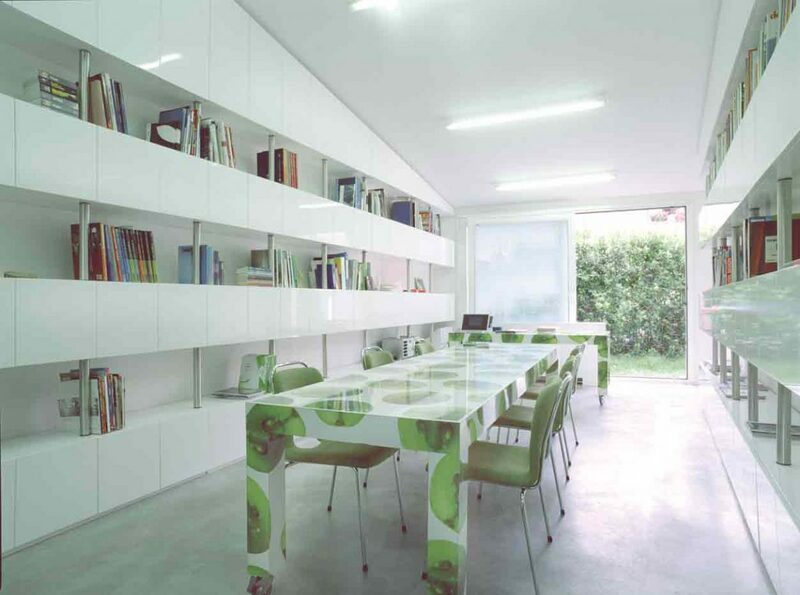 Micheli office. 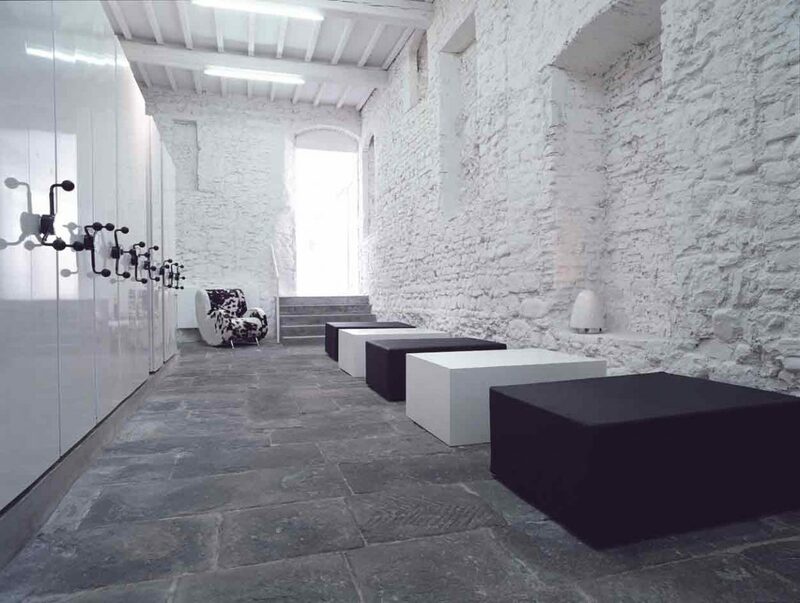 The original flooring divided in irregular blocks of stone that characterizes the space of the reception area and the archive, was recovered with a careful restoration; the area dedicated to development projects, long time ago was cobblestone, now it is in cement industry. A design based on total white, where the perimeter walls have been completely plastered to exalt the candidly colourful stone structure and the girders of the ceiling have been pickled in white. 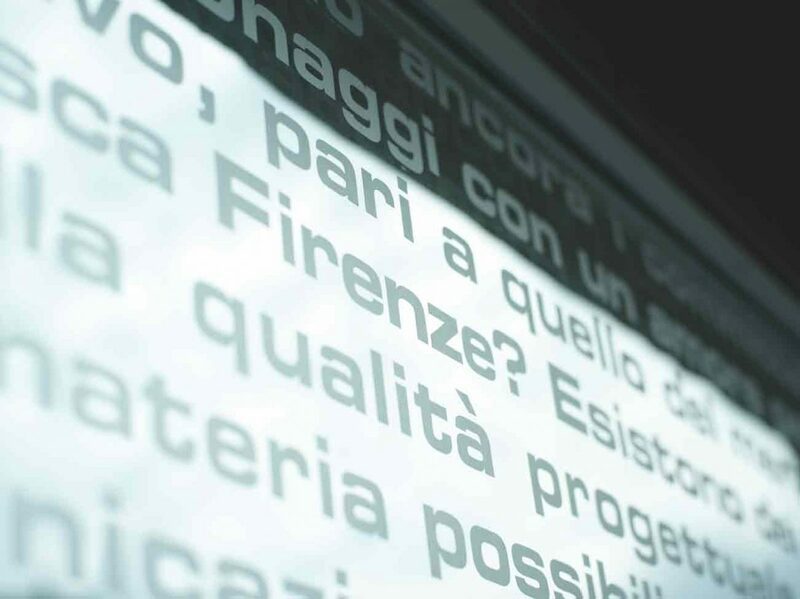 The large windows in front of the building introduce these intriguing interiors to the road-life, etched written that run throughout the glasses, tell about the philosophical and planning idea of Simone Micheli. 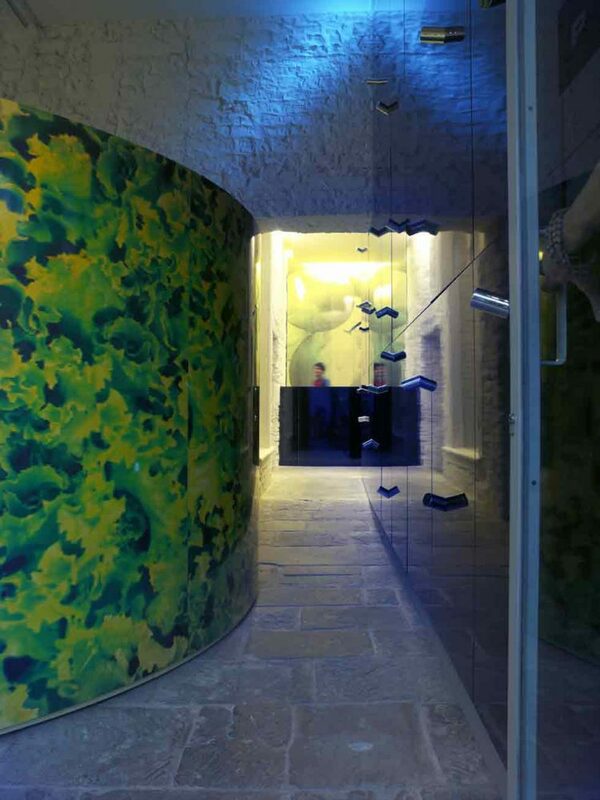 In the white area of entry, with flooring composed by blocks of irregular stone and wooden ceiling, stands the totem cylindrical volume of reception area, completely covered with laminated digital prints, which represents macro images of salad. A large angular fitted cupboard made of shiny black laminate which cover also the bathrooms, with his tips/handles of polished stainless steel, acts as energetic contrapuntal element as regards the ironic cylinder characterized by strong chromatics. The scenic bathrooms, enclosed in this black and shiny parallelepiped, are characterized by diffuse lights, the head-on wall of the ante-bathroom covered by a mirror, has a rectangular slot in steel, in which there are sources of supply, soap and water, monitored by electronic sensors, an allusive reference to the horse drinking troughs present in the historic building. 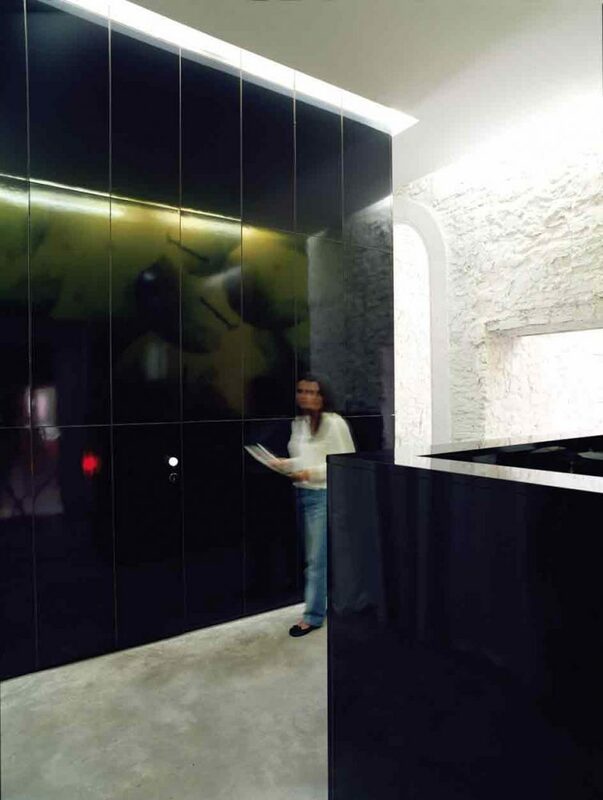 Two black sliding glass doors introduce to two bathrooms “Juliet” and “Romeo”, completely resined with spatula, strictly in shiny black, where the only light comes from this blue light blade present in this radiant “Nouvage” designed by the same Micheli as the sanitary fittings “Block”, rectangular volumes made in corian: the only white sign in this small space. 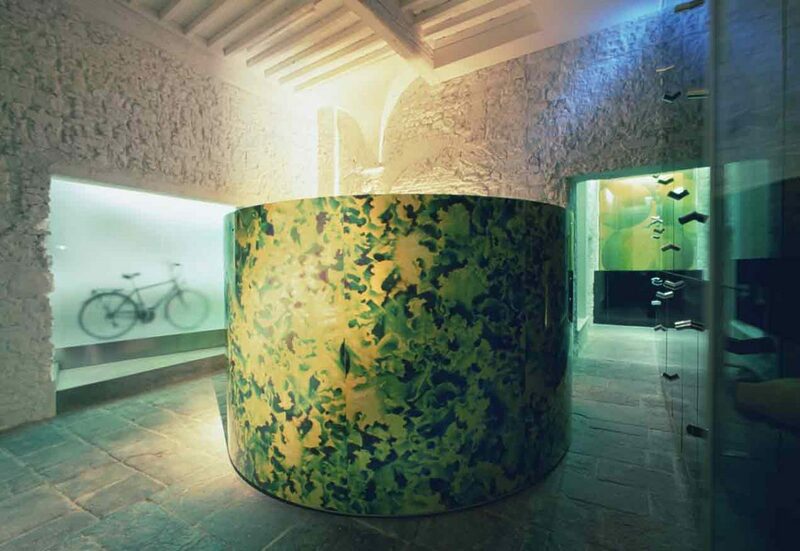 In front of the bathroom area, a place equipped as press office, presents a black laminate counter, on its back stands a fifth-coated cupboard completely covered by a laminate with drawings of macro lemons. Going down some steps the visitor is wrapped in an charming meeting room, characterized by a white central table and quilted chairs “OO” (designed by Simone Micheli), the covering wall and the vaulted ceiling are completely made of stones and bricks, panels covered with mirror with spotlights hidden on the back, create unusual light effects and light games highlight the present rough surfaces. 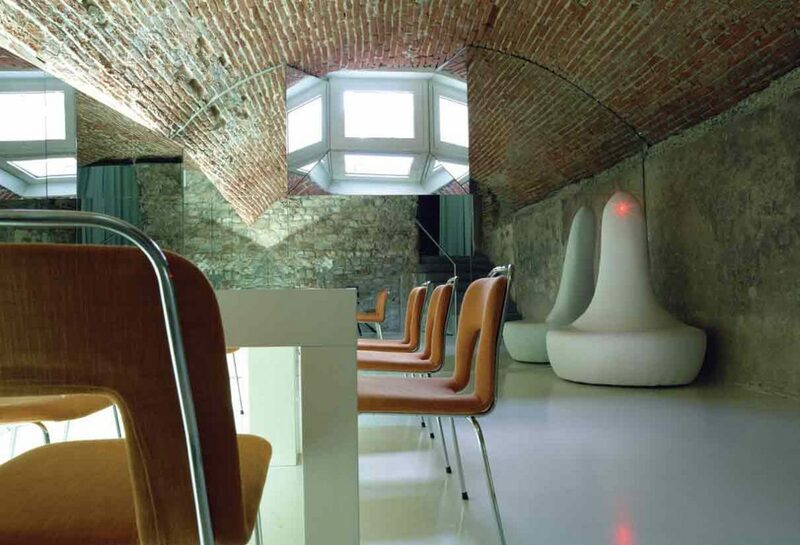 On the bottom of the room, stands alone “Polyphemus”, an armchair made of white sky with an eye made with a red led (designed by Simone Micheli). 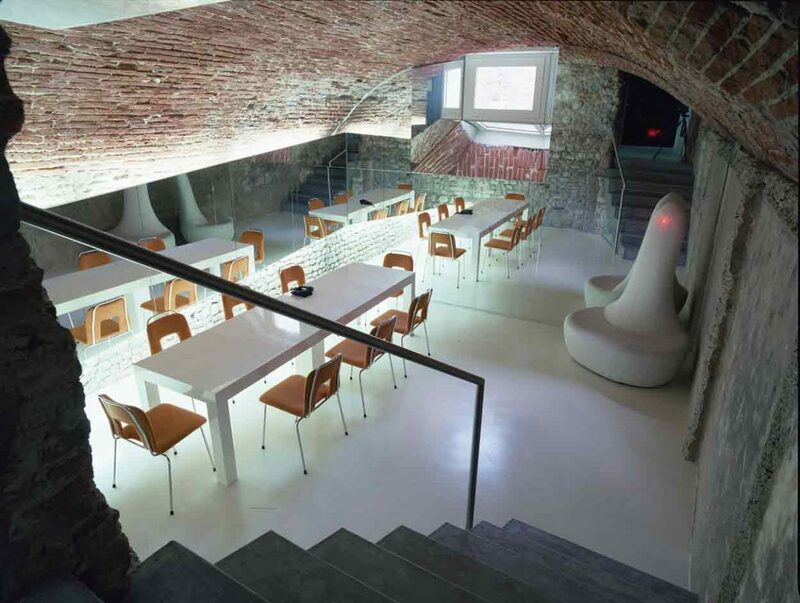 The area dedicated to the development projects is characterized by large rooms on two levels with white plastered walls and wooden ceilings pickled in white, shelves and tables in white laminate. 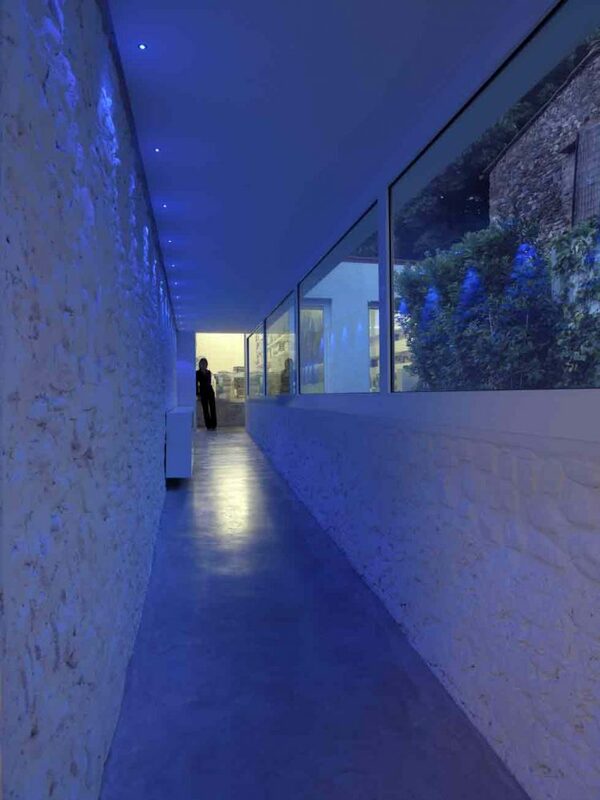 An exciting glass path that looks the garden is illuminated in a particularly scenic way by a row of blue leds, which accompanies the user until the office- meetings hall of Architect Micheli and until the graphic office directed by Roberta Micheli, that is highly characterized by a wall entirely covered with a laminate with a digital printing. 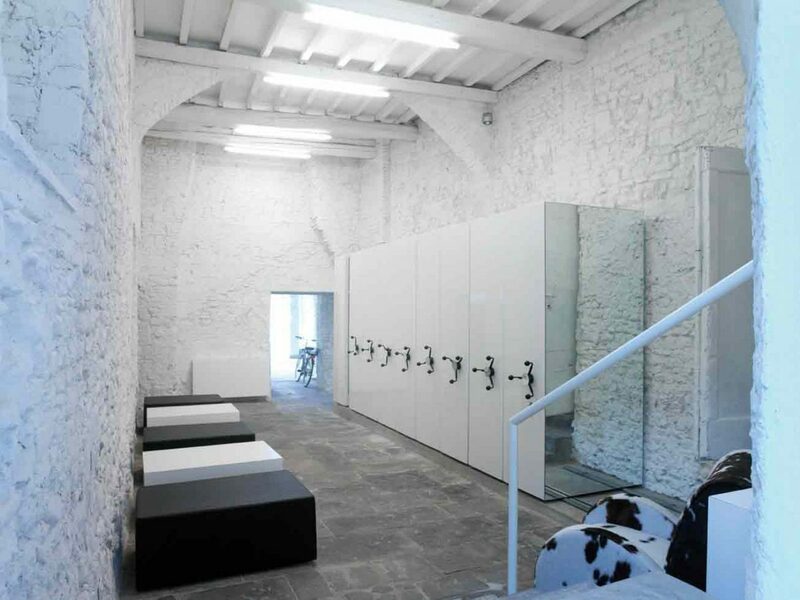 The studio of the architect presents white lacquered shelves with opening doors, which run along all the walls, at the bottom of the fifth, completely covered by a mirror with plasma, introduces in the small bath in glossy black resin given with spatula, sanitary fittings in white Corian, the chromed faucets “Zpoin” (designed by Simone Micheli) and small circular mirrors. The big central area of the archive and waiting room keeps intact the original masonry structures; the ceiling with big girders and hollow clay tiles and walls with niches and fissures once present. Big rectangular seats in black sky spaced out by volumes in white laminate with function of table, stand in front of the big mobile-archive made of metal. 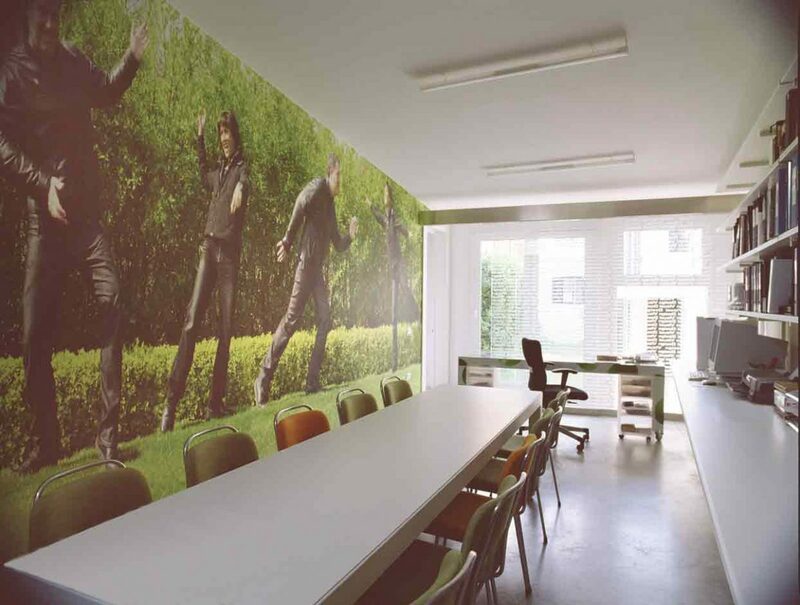 A renovated and highly emotional area, the Simone Micheli architectural studio represents an interesting design operation that reinterprets traditional materials in a seductive theatricality that makes them dumb players of continue scenic games created by essential furniture and by coatings. 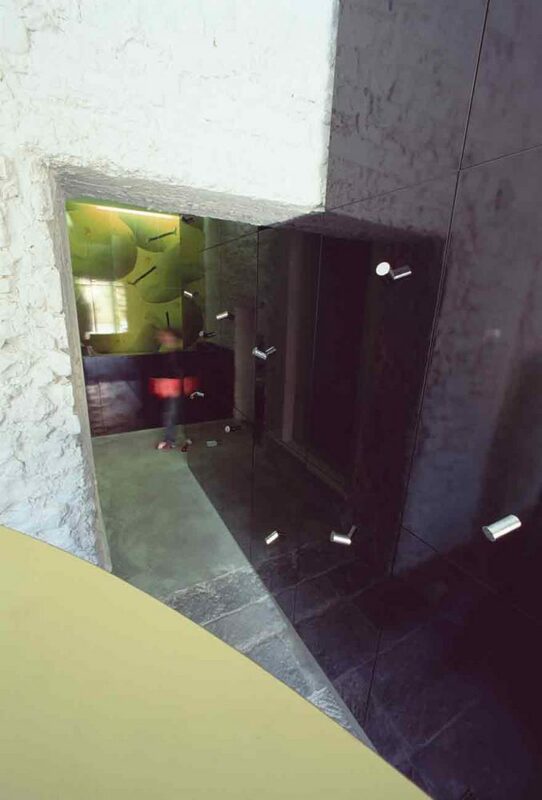 The area shows like a project dream linked to a possible future could harmoniously dialogue with an ancient masonry structures of a fifteenth-century complex.